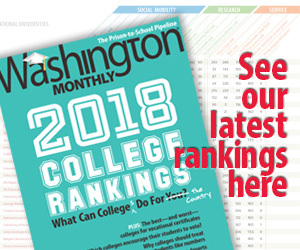 Washington Monthly | Can Matthew Whitaker be Thrown Out of Office By the Courts? Can Matthew Whitaker be Thrown Out of Office By the Courts? I follow politics very closely so I have a thorough understanding of the basic structures—the checks and balances—in the American governmental system. For example, I know that the U.S. Senate (not the House) is responsible for vetting a president’s nominations. This is established in the advise-and-consent clause contained in Article 2, Section 2 of the Constitution. There is a provision for recess appointments that may be necessary when Congress is out of session, but that’s less of an issue now that the horse and buggy has been replaced by jet airliners. In general, the president cannot just put someone in charge of a major government agency without that person having been confirmed by the Senate. But things can get complicated. Sometimes, lawyers need to be consulted. Our agencies have deputies and undersecretaries that can serve on a temporary or interim basis if an agency head can no longer do the job, and these are the people who normally step up when a cabinet member quits, gets fired, or dies. The key requirement for these short-term substitutes is that they have already been vetted by the Senate for their currently-held position. So presumably, they aren’t completely unacceptable. These arrangements were most recently codified in the Federal Vacancies Reform Act of 1998. When Trump fired Jeff Sessions at his attorney general, the “first assistant of the office” was Deputy Attorney General Rod Rosenstein. But the entire point of firing Sessions was to take Rosenstein off the Mueller case, so that would not provide a solution for the president. Trump could have chosen some other Senate-confirmed officer, even someone from the departments of Agriculture or Commerce. But he wanted someone he could depend on to protect him from the Russia investigation. Which is why he relied on the third category. According to the Department of Justice’s Office of Legal Counsel, Matthew Whitaker served for at least 90 days as an employee of the DOJ (as Session’s chief of staff) at a GS-15 federal pay grade. As a result, Trump seems to be technically within his rights to put Whitaker in as attorney general for somewhere between 120-210 days (for the correct number, ask a lawyer). First of all, this issue hinges on complicated interpretations of statutory language more than the broad outlines of the Constitution. I don’t think the average American can understand it as easily as they can understand an episode of Schoolhouse Rock. Secondly, the real issue does not appear to be whether Trump can appoint someone with a GS-15 pay grade to the position, but whether he can corruptly install someone in any position for the express and implied purpose of obstructing justice. Obviously, smarter people than me will hash this out in front of judges, but it’s not some slam-dunk case. They will have to prove that they have standing, then they’ll probably have to prove criminal intent. What really makes me curious, though, is why so few Democratic senators added their name to this suit. If they want to be taken seriously, they should be unanimous on this one. Does Chuck Schumer have some other plan or does he see this as a gambit fated for failure?